Look back on some of the most memorable moments in NFL combine history. At this week's 2016 NFL Scouting Combine, a large crop of prospective NFL players will face a series of physical and mental tests so that NFL teams can assess their talent. A player's performance at the combine can go a long way to determining where he'll be drafted. While most details of the combine might be quickly forgotten by everyone except NFL scouts, several moments over the years stand out, both on and off the field. As this year's combine gets underway, we rounded up some of the most memorable moments in NFL Scouting Combine history. In 2012, Robert Griffin III ran a 4.38 40-yard dash, the second-highest for a quarterback behind Michael Vick’s 4.33. Texas A&M QB Reggie McNeal ran a 4.35 in 2006, but was classified as a wide receiver. Griffin’s athleticism was elite for a his position, and the performance solidified him further as a top pick in the upcoming NFL draft. Johnson set a combine record by running his 40-yard dash in 4.24 seconds. He was taken by Tennessee with the No. 24 pick in the 2008 draft. 260 pounds. 4.61u 40-yard dash. You, Dante Fowler, are a monster. 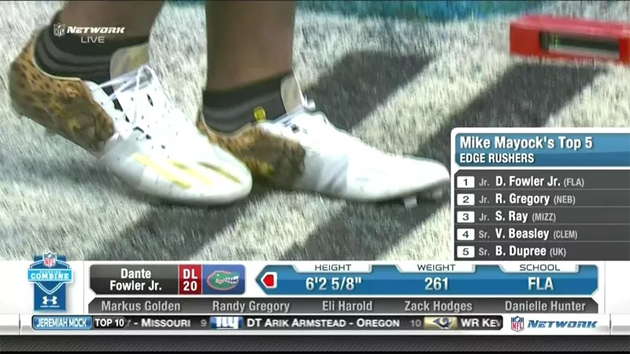 In 2015, Florida defensive lineman Dante Fowler Jr. ran a 4.61 40-yard dash while wearing a gold watch and cheetah cleats. He was taken with the No. 3 pick in the draft, but sat out the entire 2015 season after injuring his knee before the season. Tom Brady’s quarterback drills were rather pedestrian, as were his other agility drills. He actually leaped just 24.5" in the vertical jump, which ranked 283 out of 288 QBs. The Michigan product was famously selected in the sixth round of the 2000 draft by the Patriots. Footage from the four–time Super Bowl winning quarterback's combine remains a staple on Patriots game broadcasts. In 2009, USC kicker David Buehler put up a ridiculous 25 reps of 225 pounds at the combine. 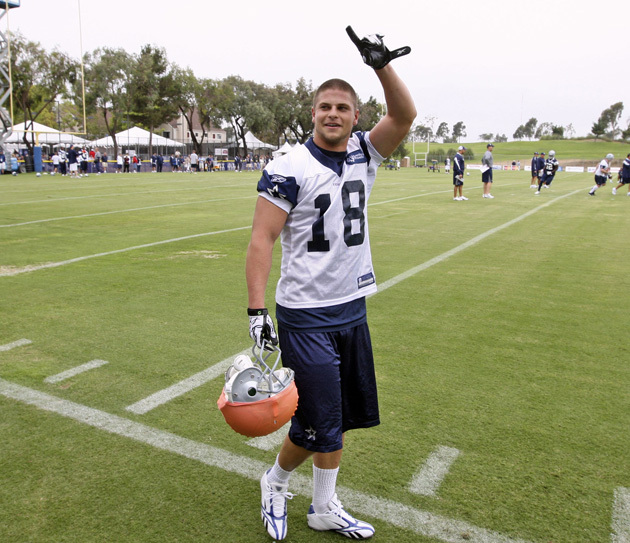 He was taken in the fifth round by the Dallas Cowboys, and fell out of the league in 2013 after a cup of coffee with the Giants. The UConn cornerback broke a world record by leaping 12'3" in the broad jump. He added an impressive 44.5 vertical. 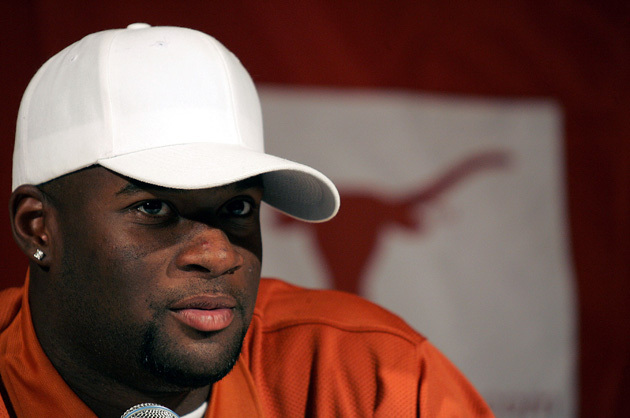 Young was one of the top talents in the 2006 draft, but several critics pointed to his disastrous reported Wonderlic score of six. Young tested again and earned a 16. The Titans used the No. 3 pick on Young weeks later. For the record, Young's Wonderlic was not the lowest score ever recorded. Cowboys cornerback Morris Claiborne notably scored a 4 in 2012, and other players have also fared worse than Young. Two wideouts in the 2013 combine—Clemson’s DeAndre Hopkins and Rutgers’ Mark Harrison—shared a hotel room that was discovered trashed. The mess reportedly included feces, urine and half–eaten food. Representatives for both players denied that they had anything to do with the incident. Hopkins has risen the wide receiver ranks with the Texans, while Harrison went undrafted and spent time with the Bears, Patriots and Chiefs before joining the CFL.